Candice's Beauty Blog! : Wayne Goss brushes ordered!! 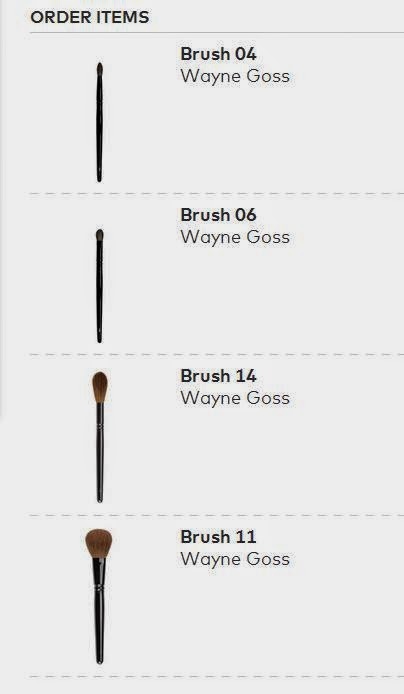 I don't even have anything real to share but I can't contain my excitement about ordering 4 of the Wayne Goss brushes just now!!! My brush collection is basically a 15-piece kit from elf, the eye set from Real Techniques and a few kabuki brushes so this order is really really something special! I hope I won't be disappointed because just these 4 brushes are worth more than 3x what I paid for the whole rest of my collection (about 25 brushes). I really love Wayne Goss on youtube and based on that and the reviews... sounds like I can't go wrong. I just hope I picked up the right ones that I will love. Brush 11 - the largest "powder brush" by Wayne Goss... I mostly want it for that reason (powder) but it'll be nice to try for blush and foundation to see what it can achieve. After 3 days of intensive research from reading the descriptions, reading a lot of blogs, watching a lot of videos on youtube... I decided on which ones I wanted to buy. I wasn't sold on every single brush of any of the sets (based on what they do and my own needs) so I went for a couple brushes that I feel more sure that I'd want to use often. When I set up my low-buy for summer 2014 (June to mid-Sept) I gave myself a 120$ budget... When I started wanting these brushes, I gave myself a 200$ish budget, convincing myself by saying it's about the equivalent of buying one full set, but that I'd customize it myself... I'm proud to say that I purchased fewer brushes than I originally thought and it was 124USD for these. I'm sad that this is my whole summer's budget though!!! lol I have a feeling I'm going to fail... Whichever brush of these I didn't have an equivalent for, I'll re-give myself the amount as my summer budget. Better fail with limits than fail like crazy! Have you tried these brushes, what did you think of them? Any link to a blog post or youtube video you made? I would love to hear about your review and I hope they are what you wanted. I don't know why I thought they were on par with M.A.C brushes. *shrugs* On my wishlist with Goss are Bdellium brush kits. From what I've been reading, they're most comparable to Hakuhodo brushes since they're made in Japan with the same materials and have a similar style/design. I've never purchased a MAC brush so I don't really know the difference in price for similar shaped and sized brushes but it's similar - maybe the Goss ones are a tad more expensive? I think overall they can be comparable.